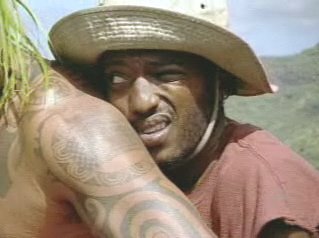 This was one of my favorite moments of Marquesas, and it also happened to be one of the most genuinely touching. 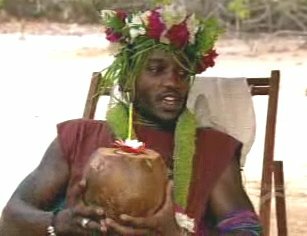 In fact this is the type of scene that they honestly don't have a lot on Survivor anymore. The show ceased trying to be deep and emotional a long time ago. Nowadays it's mainly just concerned with strategy. But it didn't used to be that way. 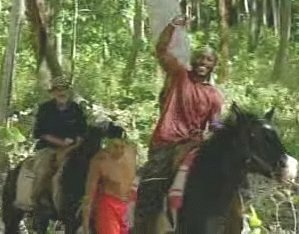 In fact, on a Marquesan beach back in 2002, a black kid from Harlem and a white judge from Georgia had one of the most emotionally moving rewards we have ever seen on Survivor. It was the ninth episode of Marquesas and the players were competing for a Marquesan barbecue. There were eight players left in the game, so they were randomly split into four teams of two. And that's how we ended up with Sean Rector (an angry young black teacher from Harlem) being paired with Paschal English (a conservative old white judge from the south). It was the most unlikely of pairings, yet Paschal and Sean came through as a team to win the challenge. And better yet, they won the reward. So here we have two guys with absolutely nothing in common, yet they find themselves thrust together on the reward trip of a lifetime. They are off to watch a Marquesan pig roast, and they are going to have a great time. But unfortunately, the trip gets off to a rocky start. The problem is that Paschal and Sean have to get to the feast via horseback, but Sean has never ridden a horse before in his life. He even takes the time to explain this to us. He says, "The only horse I've ever been on is the merry-go-round in Central Park." So Sean tries to mount his horse, and he is immediately spooked when he realizes he has no control over what this animal is going to do. Panicked, Sean insists on riding with one of the Marquesan guides instead. And there's this incredibly funny shot of Sean clinging for dear life to the back of a Marquesan. No matter who is riding with him, Sean just isn't comfortable on the back of a horse at all. Despite Sean's fears, this new strategy (clinging to somebody else) seems like it will work on paper. After all, how hard can it be to hold on to another rider? How much work will Sean really have to do? Well what Sean didn't take into account is the fact that his balls are going to racked in this particular position. He didn't plan for physics in this new seating arrangement, and now Sean's balls are paying the ultimate price. Sean even tries to share this news with his seatmate. He very respectfully (and very politely) says to the Marquesan, "Uh, my balls. My balls. They really hurt." "My balls really hurt, sir." So anyway, this new approach doesn't really work. Sean's nads hurt too much, and it just isn't worth it for the extra security. So instead he ends up back on his own horse, with the Marquesans pulling him with a piece of rope. It isn't the most glamorous way to ride on a horse, but at least Sean can say he rode one. And as a bonus, he even ends the trip with both of his testicles. Sean's triumphant arrival at the Marquesan village. Sean's adventure with the horse was funny enough to make the list on its own, but his experience at the barbecue was amusing enough to be mentioned as well. Because for one, Sean was just an incredible motor mouth at the feast. He sat there and he provided a hilarious, nonstop, running commentary for just about everything that happened throughout the meal. The highlight for me was when Sean hit on their female hostess at the start ("You're a little bit too young for me"), but I also enjoyed his Mystery Science Theater-style commentary when the Marquesan host was explaining what they were going to be doing. Sean was simply at the top of his game here, and the fact that he and Paschal ended up trying to dance with food stuffed in their pants was just icing on the cake. This was simply a dynamite comedic sequence all around. 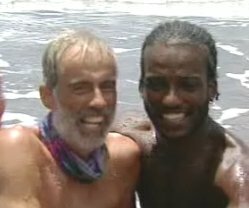 In the end, Paschal and Sean's barbecue trip was one of the most heartfelt bonding moments I have ever seen on Survivor. These were two guys from absolute different walks of life, who had a chance to meet one another and enjoy each other's company on a day they were never really going to forget. 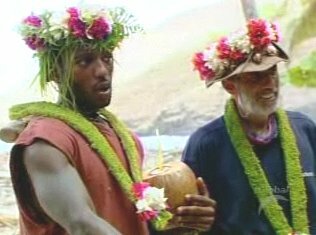 It's the type of character interaction they really don't show anymore on Survivor, and that's a shame. 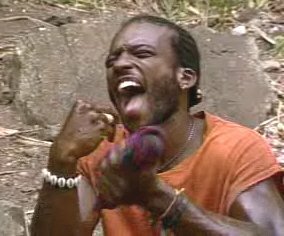 But for me, it was also one of the funniest scenes involving one of the funniest characters (Sean) in Survivor: Marquesas. This was Sean's greatest moment in an already outstanding season. And I really think he should have been invited to play in All-Stars.